This entry was posted on Monday, November 9th, 2009 at 11:04 pm	and is filed under Desserts. You can follow any responses to this entry through the RSS 2.0 feed. You can leave a response, or trackback from your own site. You convinced me. I have some pumpkin sitting in my fridge waiting to be used. This is perfect. Gimme gimme gimme. I need. I need. Yes, please. I’d like to dip my finger in that icing. Yum! Dammit. This is like putting as loaded gun in my hands and some itchy powder on my fingers. Wow, they even look like the Starbucks ones–pretty AND yummy! Holy my apartment smells amazing! This is my first ever attempt at scones, and let me just say that this is a very easy recipe. I just pulled them out of the oven, and I’m not sure I can wait for them to cool to drizzle them in that amazing spiced glaze and sink my teeth into them … OH BOY my pumpkin-loving girlfriend is going to fall even more in love with me HA! Wow. These are awesome. 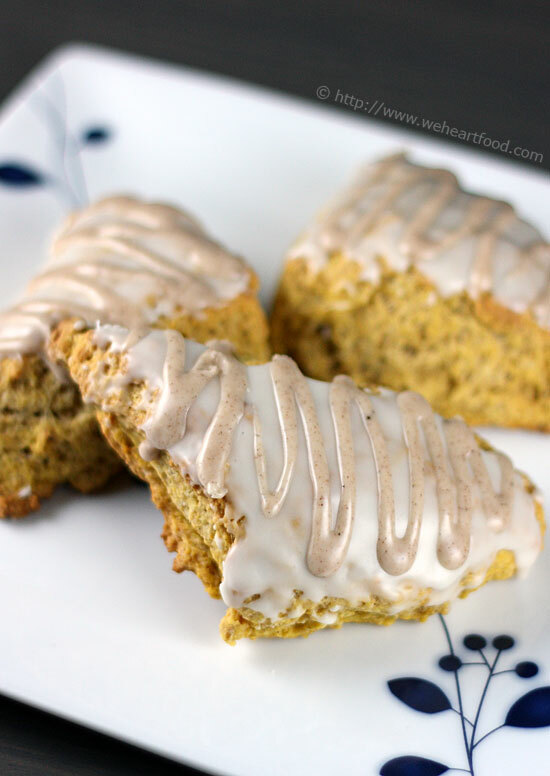 I had a week long craving for a Starbucks pumpkin scone. I’m glad I resisted and made these instead! I just made these for my mom’s visit and we both LOVE them!! Delish! Thank you, very much! Wow! These could be dangerous to my health! Tried your recipe – love then! Love them! Love them! Thnaks! I made these scones, adapted to be gluten-free, dairy-free, and soy-free and blogged about it here. Oh my gosh, so good! Thanks for inspiring Brown-Eyed Baker to make them! We Love WTFOMG Scones! Seriously – they are unreal!